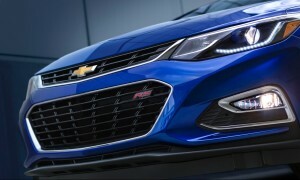 General Motors has revealed the 2016 Chevrolet Cruze, a second-generation edition GM says is up to 250 pounds lighter than the 2015 Cruze. Its news release, however, fails to “show your work,” attributing 53 pounds of the savings to a lighter but larger body but failing to account specifically for the other 197 pounds. We couldn’t find these numbers in GM’s releases, but Car and Driver reported that the engine is 44 pounds lighter and the transmission weighs 24 pounds less than in the past. So that explains some of the weight loss, but we’re still 121 pounds shy. This leaves us with little to tell collision repairers about advanced materials they’ll be fixing; a GM spokeswoman did not respond to email and phone requests Thursday for elaboration on the steel. Hot-stamped steel usually means steel of 1,000 megapascals or tougher, compared to traditional mild steel in the 250-270 MPa range. So GM probably doesn’t mean that 8 percent referenced in the release is all the true high-strength steel (anything above 270 MPa) in the body. “The 2016 Cruze’s safety story begins with the new, stronger body structure that incorporates high-strength steel in key areas to enhance strength and crash protection by helping to prevent intrusion into passenger compartment,” GM wrote in the news release. However, for what it’s worth, here’s how the body materials broke down on the 2015 Chevrolet Cruze. We’d predict that everything dual-phase there upscales in the 2016 model to a stronger dual-phase grade or an ultra-high-strength steel in Chevrolet’s hot-stamped range. Steel grades are maddeningly messy and inconsistent between automakers — without specific megapascal figures, there’s no way to tell precisely what “dual-phase” and “ultra-high-strength” means for GM compared to the rest of the world. But based on this 2014 GM chart, dual-phase on the 2015 Cruze is either 550-800 MPa or 800-1,000 MPa steel. GM also hinted in its release that an aluminum engine and suspension helped save weight as well. Chevrolet sold more than 273,000 Cruzes in 2014 in America, up 10 percent.